That’s why it’s fitting for the BSA to introduce a new merit badge: Exploration. The badge — the 137th on the BSA’s list of currently available merit badges — celebrates the spirit of adventure that has inspired Scouts for more than a century. That spirit helped Eagle Scout Paul Siple, who coined the term “wind chill,” travel to Antarctica with Adm. Richard Byrd in 1928. It helped Eagle Scout Neil Armstrong land on the moon in 1969. 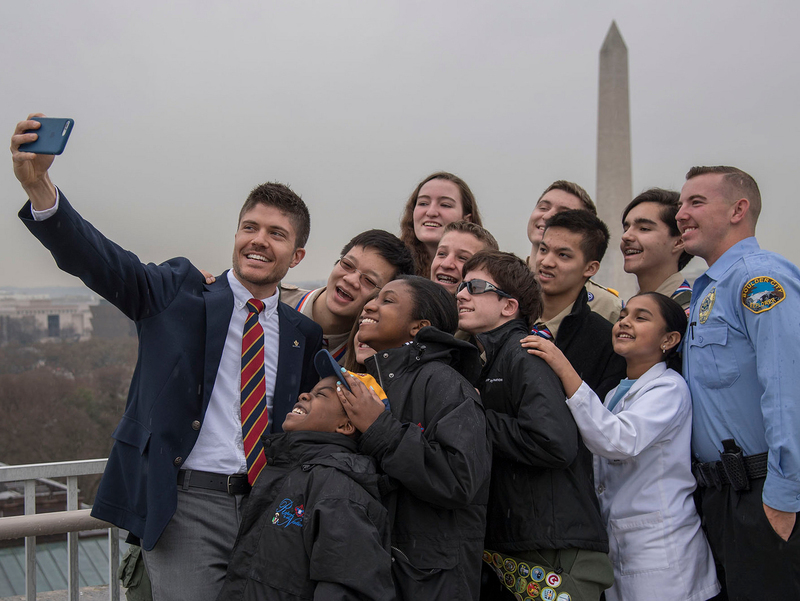 And it helps today’s Eagle Scouts explore the world through opportunities like the National Eagle Scout Association’s World Explorers Program. After learning about the history and importance of exploration, Scouts plan, prepare for and go on an actual expedition. The expedition need not be to Mount Everest or the Marianas Trench. Scouts must plan and take a trip to somewhere of interest to them; it can be close by or far away. It can be a troop activity or a small-scale excursion. Once there, the Scout will study something. Maybe he’ll analyze a location’s animal population, classify plant species at a state park or explore the effects of drought on an area. The primary goal is that the Scout learns something, plans the trip (with his counselor’s OK) and has fun. The Exploration merit badge pamphlet itself was a collaborative effort involving some of the planet’s top modern-day explorers. The list includes Michael Manyak, a renowned consultant on expedition medicine; Lee Berger, a paleoanthropologist who has made breakthrough discoveries about the history of humans; and Scott Parazynski, an astronaut who has both flown in space and summited Mount Everest. Though some adult explorers make their discoveries alone, Scouts must have qualified supervision during their expedition. The merit badge counselor could serve this role, or it could be fulfilled by an expedition advisor OK’d by the counselor. Either way, the Youth Protection policy of two-deep leadership applies. Who makes a worthy expedition advisor? School science teachers, museum educators, park rangers, nature instructors or anyone with scientific knowledge. The Exploration merit badge, officially released in December 2016, is the BSA’s first new merit badge since Animation in May 2015. It also could be the last new merit badge for a little while. The BSA’s Merit Badge Maintenance Task Force has shifted its focus to improving requirements for existing merit badges. Speaking of, that’s why Scouts and merit badge counselors should always check this site for the latest requirements before starting a merit badge. This summer, National Geographic will team up with the BSA as a presenting sponsor to offer Scouts the opportunity to begin earning the Exploration merit badge during the 2017 National Jamboree at the Summit Bechtel Reserve. Scouting Newsroom has more details. Feel free to use the image below or this flyer (PDF) to promote the merit badge in your troop, district and council.